No, but I've been in like. That's a fine profession. Does he like it? He only has one thing to complain about. What did your mommy tell you not to say? My mother told me not to tell any of the family secrets, like the time she dyed her hair blonde and it came out purple. What does your mother say when you ask for one? (Little girl, asked about her pets): I used to have a duck but it ran away. Then I had a turtle, but my father stepped on it. Then I had three goldfish, but my sister put water softener in their bowl and they softened to death. What if a plane was in danger over the Rocky Mountains? I'd put parachutes on everybody and if there wasn't any parachutes I'd sew up sheets into parachutes real fast and put in extra pillows so if the sheets ripped on the way down, they could always land on the pillows. You can find other kid stories here. Please join me in praying for the Linkletter family. 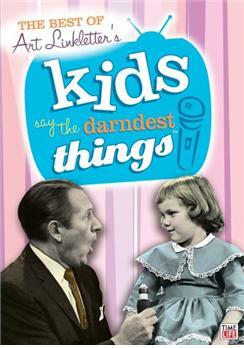 Oh Bob, Art Linkletter was such a special man. I loved when TV was fun and clean. His show was one of the best. I enjoyed him tremendously. I saw the news articles yesterday on his passing. I didn't realize he was 97. I didn't realize he was that old either. His TV shows were always so much fun...good clean fun.